For other uses, see Piccadilly (disambiguation). Piccadilly (/ˌpɪkəˈdɪli/) is a road in the City of Westminster, London to the south of Mayfair, between Hyde Park Corner in the west and Piccadilly Circus in the east. It is part of the A4 road that connects central London to Hammersmith, Earl's Court, Heathrow Airport and the M4 motorway westward. St James's is to the south of the eastern section, while the western section is built up only on the northern side. Piccadilly is just under 1 mile (1.6 km) in length, and is one of the widest and straightest streets in central London. The street has been a main thoroughfare since at least medieval times, and in the Middle Ages was known as "the road to Reading" or "the way from Colnbrook". Around 1611 or 1612, a Robert Baker acquired land in the area, and prospered by making and selling piccadills. [nb 1] Shortly after purchasing the land, he enclosed it and erected several dwellings, including his home, Pikadilly Hall. What is now Piccadilly was named Portugal Street in 1663 after Catherine of Braganza, wife of Charles II, and grew in importance after the road from Charing Cross to Hyde Park Corner was closed to allow the creation of Green Park in 1668. Some of the most notable stately homes in London were built on the northern side of the street during this period, including Clarendon House and Burlington House in 1664. Berkeley House, constructed around the same time as Clarendon House, was destroyed by a fire in 1733 and rebuilt as Devonshire House in 1737 by William Cavendish, 3rd Duke of Devonshire. It was later used as the main headquarters for the Whig party. Burlington House has since been home to several noted societies, including the Royal Academy of Arts, the Geological Society of London and the Royal Astronomical Society. Several members of the Rothschild family had mansions at the western end of the street. St James's Church was consecrated in 1684 and the surrounding area became St James Parish. The Old White Horse Cellar, at No. 155, was one of the most famous coaching inns in England by the late 18th century, by which time the street had become a favoured location for booksellers. The Bath Hotel emerged around 1790, and Walsingham House was built in 1887. Both the Bath and the Walsingham were purchased and demolished, and the prestigious Ritz Hotel built on their site in 1906. Piccadilly Circus station, at the east end of the street, was opened in 1906 and rebuilt to designs by Charles Holden between 1925 and 1928. The clothing store Simpson's was established at Nos. 203–206 Piccadilly by Alec Simpson in 1936. During the 20th century, Piccadilly became known as a place to acquire heroin, and was notorious in the 1960s as the centre of London's illegal drug trade. Today, it is regarded as one of London's principal shopping streets. Its landmarks include the Ritz, Park Lane, Athenaeum and Intercontinental hotels, Fortnum & Mason, the Royal Academy, the RAF Club, Hatchards, the Embassy of Japan and the High Commission of Malta. Piccadilly has inspired several works of fiction, including Oscar Wilde's The Importance of Being Earnest and the work of P. G. Wodehouse. It is one of a group of squares on the London Monopoly board. Apsley House on an 1869 map. The neighbouring houses were demolished in the early 1960s to allow Park Lane to be widened. The Wellington Arch has been moved since this time. The street has been part of a main road for centuries, although there is no evidence that it was part of a Roman road, unlike Oxford Street further north. In the Middle Ages it was known as "the road to Reading" or "the way from Colnbrook". During the Tudor period, relatively settled conditions made expansion beyond London's city walls a safer venture. Property speculation became a lucrative enterprise, and developments grew so rapidly that the threat of disease and disorder prompted the government to ban developments. Owing to the momentum of growth, the laws had little real effect. Baker became financially successful by making and selling fashionable piccadills. Shortly after purchasing the land, he enclosed it (the parishioners had Lammas grazing rights) and erected several dwellings, including a residence and shop for himself; within two years his house was known as Pickadilly Hall. [nb 3] A map published by Faithorne in 1658 describes the street as "the way from Knightsbridge to Piccadilly Hall". A nearby gaming house, known as Shaver's Hall and nicknamed "Tart Hall" or "Pickadell Hall", was popular with the gentry of London. Lord Dell lost £3000 gambling at cards there in 1641. After Robert Baker's death in 1623 and the death of his eldest son Samuel shortly afterward, his widow and her father purchased the wardship of their surviving children; the death of the next eldest son, Robert, in 1630, allowed them to effectively control the estate. Their only daughter died, and her widower Sir Henry Oxenden retained an interest in the land. Several relatives claimed it,[nb 4] but after Mary Baker's death in about 1665, the estate reverted to the Crown. A great-nephew, John Baker, obtained possession of part of it, but squabbled over the lands with his cousin, James Baker; trying to play one another off, they paid or granted rights to Oxenden and a speculator, Colonel Thomas Panton, eventually losing out to them. By the 1670s, Panton was developing the lands; despite the claims of some distantly-related Bakers, he steadily built them up. Piccadilly was named Portugal Street in 1663 after Catherine of Braganza, wife of Charles II. Its importance to traffic increased after an earlier road from Charing Cross to Hyde Park Corner was closed to allow the creation of Green Park in 1668. After the restoration of the English monarchy in 1660, Charles II encouraged the development of Portugal Street and the area to the north (Mayfair), and they became fashionable residential localities. Some of the grandest mansions in London were built on the northern side of the street. Edward Hyde, 1st Earl of Clarendon and close political adviser to the king, purchased land for a house; Clarendon House (now the location of Albemarle Street) was built in 1664, and the earl sold the surplus land partly to Sir John Denham, who built what later became Burlington House. Denham chose the location because it was on the outskirts of London surrounded by fields. The house was first used to house the poor, before being reconstructed by the third Earl of Burlington in 1718. Berkeley House was constructed around the same time as Clarendon House. It was destroyed by a fire in 1733, and rebuilt as Devonshire House in 1737 by William Cavendish, 3rd Duke of Devonshire, and was subsequently used as the headquarters for the Whig party. Devonshire House survived until 1921, before being sold for redevelopment by Edward Cavendish, 10th Duke of Devonshire for £1 million. Burlington House has since been home to the Royal Academy of Arts, the Geological Society of London, the Linnean Society of London, the Royal Astronomical Society, the British Astronomical Association, the Society of Antiquaries of London and the Royal Society of Chemistry. The land to the south of Piccadilly was leased to trustees of the Earl of St Albans in 1661 for a thirty-year term, subsequently extended to 1740. Nos. 162–165 were granted freehold by the king to Sir Edward Villiers in 1674. The White Bear Inn had been established between what is now No. 221 Piccadilly and the parallel Jermyn Street since 1685. It remained in use throughout the 18th century before being demolished in 1870 to make way for a restaurant. St James's Church was first proposed in 1664, when residents wanted the area to become a separate parish from St Martin in the Fields. After several Bill readings, construction began in 1676. The building was designed by Christopher Wren and cost around £5,000. It was consecrated in 1684, when the surrounding area became St James Parish. Piccadilly was increasingly developed, and by the middle of the 18th century it was continuously built on as far as Hyde Park Corner. The development of St James's and Mayfair, in particular, made Piccadilly one of the busiest roads in London. Hugh Mason and William Fortnum started the Fortnum & Mason partnership on Piccadilly in 1705, selling recycled candles from Buckingham Palace. By 1788, the store sold poultry, potted meats, lobsters and prawns, savoury patties, Scotch eggs, and fresh and dried fruits. The street acquired a reputation for numerous inns and bars during this period. The Old White Horse Cellar, at No. 155, was one of the most famous coaching inns in England but was later destroyed. The Black Bear and White Bear (originally the Fleece) public houses were nearly opposite each other, although the former was demolished in about 1820. Also of note were the Hercules' Pillars, just west of Hamilton Place, the Triumphant Car, which was popular with soldiers, and the White Horse and Half Moon. The Bath Hotel emerged around 1790 and Walsingham House was built in 1887. The Bath and the Walsingham were demolished when the Ritz Hotel opened on the site in 1906. No. 106, on the corner of Piccadilly and Brick Street, was built for Hugh Hunlock in 1761. It was subsequently owned by the 6th Earl of Coventry who remodelled it around 1765; most of the architecture from this renovation has survived. In 1869, it became home to the St James's Club, a gentleman's club that remained there until 1978. The building is now the London campus of the Limkokwing University of Creative Technology. Several members of the Rothschild family had mansions at the western end of the street. Nathan Mayer Rothschild moved his banking premises to No. 107 in 1825, and the construction of other large buildings, complete with ballrooms and marble staircases, led to the street being colloquially referred to as Rothschild Row. Ferdinand James von Rothschild lived at No. 143 with his wife Evelina while Lionel de Rothschild lived at No. 148. Melbourne House was designed by William Chambers for Peniston Lamb, 1st Viscount Melbourne and built between 1770 and 1774. It was converted to apartments in 1802, and is now the Albany. The house has been the residence for the British Prime Ministers William Ewart Gladstone and Edward Heath. St James's Hall was designed by Owen Jones and built between 1857–8. Charles Dickens gave several readings of his novels in the hall, including Great Expectations and Oliver Twist. The hall hosted performances from Antonín Dvořák, Edvard Grieg and Pyotr Ilyich Tchaikovsky. It was demolished in 1905, and replaced by the Piccadilly Hotel. In the late 18th century, Piccadilly was a favoured place for booksellers. In 1765, John Almon opened a shop in No. 178, which was frequented by Lord Temple and other Whigs. John Stockdale opened a shop on No. 181 in 1781. The business continued after his death in 1810, and was run by his family until 1835. Hatchards, now the oldest surviving bookshop in Britain, was started by John Hatchard at No. 173 in 1797; it moved to the current location at No. 189-90 (now No. 187) in 1801. Aldine Press moved to Piccadilly from Chancery Lane in 1842, and remained there until 1894. The Egyptian Hall at No. 170, designed in 1812 by P. F. Robinson for W. Bullock of Liverpool, was modelled on Ancient Egyptian architecture, particularly the Great Temple of Dendera (Tentyra). One author described it as "one of the strangest places Piccadilly ever knew". It was a venue for exhibitions by the Society of Painters in Water Colours and the Society of Female Artists during the 19th century. It contained numerous Egyptian antiquaries; at an auction in June 1822, two "imperfect" Sekhmet statues were sold for £380, and a flawless one went for £300. By the 1920s, most old buildings on the street had been demolished or were in institutional use; traffic noise had driven away residents, but a few residential properties remained. Albert, Duke of York lived at No. 145 at the time of his accession as King George VI in 1936. The clothing store Simpson's was established at 203 - 206 Piccadilly by Alec Simpson in 1936, providing factory-made men's clothing. The premises were designed by the architect Joseph Amberton in a style that mixed art deco and Bauhaus school design and an influence from Louis Sullivan. On opening, it claimed to be the largest menswear store in London. 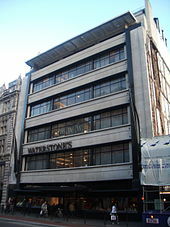 It closed in January 1999; its premises are currently the flagship shop of the booksellers Waterstones. During the 20th century, Piccadilly became known as a place to acquire heroin. Jazz trumpeter Dizzy Reece recalled people queuing outside Piccadilly's branch of Boots for heroin pills in the late 1940s. By the 1960s, the street and surrounding area were notorious as the centre of London's illegal drug trade, where heroin and cocaine could be purchased on the black market from unscrupulous chemists. By 1982, up to 20 people could be seen queueing at a chemist dealing in illegal drugs in nearby Shaftesbury Avenue. No. 144 was occupied by squatters in 1968, taking advantage of a law that allowed disused buildings to be used for emergency shelter for the homeless. The radical squatting movement that resulted foundered soon afterward, owing to the rise of drug dealers and Hell's Angels occupying the site. An eviction took place on 21 September 1969; the events resulted in the licencing of squatting organisations that could take over empty premises to use as homeless shelters. In 1983, A. Burr of the British Journal of Addiction published an article on "The Piccadilly Drug Scene", in which the author discussed the regular presence of known dealers and easy accessibility of drugs. Today, Piccadilly is regarded as one of London's principal shopping streets, hosting several famous shops. The Ritz Hotel, Park Lane Hotel, Athenaeum Hotel and Intercontinental Hotel are located on the street, along with other luxury hotels and offices. During the 20th century, it had been an established area for gentlemen's clubs; this usage has sharply declined, and only the Cavalry and Guards Club and the Royal Air Force Club remain. Piccadilly near Green Park station in 2009. Piccadilly is a major thoroughfare in the West End of London and has several major road junctions. To the east, Piccadilly Circus opened in 1819 connecting it to Regent Street. It has become one of the most recognised landmarks in London, particularly after a statue of Eros was constructed on the junction in 1893, and the erection of large electric billboards in 1923. At the western end of Piccadilly is Hyde Park Corner, and the street has a major road junction with St James's Street and other significant junctions at Albemarle Street, Bond Street and Dover Street. The road is part of the A4 connecting central London to Hammersmith, Earl's Court, Heathrow Airport and the M4 motorway. Congestion along the road has been reported since the mid-19th century, leading to its progressive widening and removing the northern portions of Green Park. Traffic signals were installed in the 1930s. In the late 1950s, the Ministry of Transport remodelled Hyde Park Corner at the western end to form a major traffic gyratory system, including enlargement of Park Lane. It opened on 17 October 1962 at a cost of £5 million. The London bus routes 9, 14, 19, 22, 38, C2, N9, N19, N22, N38 and N97 all run along Piccadilly. Part of the Piccadilly line on the London Underground travels under the street. Green Park, Hyde Park Corner, and Piccadilly Circus stations (which are all on the Piccadilly line) have entrances in or near Piccadilly. Down Street station also served the western end of the street from 1907 until it closed in 1932 because of low usage. The music hall song "It's a Long Way to Tipperary" mentions Piccadilly and Leicester Square in its lyrics. It was written in 1912 about an Irishman living in London, but became popular after being adopted by the mostly Irish Connaught Rangers during World War I. The street is mentioned in Gilbert and Sullivan's 1881 operetta Patience, in the lyrics of the song "If You're Anxious For To Shine". One of the major hit songs of the Edwardian musical play The Arcadians (1909) which enjoyed long runs in the West End of London and on New York's Broadway is "All down Piccadilly" (Simplicitas and Chorus, Act III, revised version), with music by Lionel Monckton who also co-wrote the words with Arthur Wimperis. Piccadilly is mentioned in several works of fiction. E. W. Hornung's "gentleman thief" Raffles lives at the Albany, as does Jack Worthing from Oscar Wilde's The Importance of Being Earnest. According to author Mary C King, Wilde chose the street because of its resemblance to the Spanish word peccadillo, meaning "slashed" or "pierced". In Evelyn Waugh's novel Brideshead Revisited, the mansion Marchmain House, supposedly located in a cul-de-sac off St James's near Piccadilly, is demolished and replaced with flats. In the 1981 Granada Television dramatisation, Bridgewater House in Cleveland Row was used as the exterior of Marchmain House. In Arthur Machen's 1894 novella The Great God Pan, Helen Vaughan, the satanic villainess and offspring of Pan, lives off Piccadilly in the pseudonymous Ashley Street. Margery Allingham's fictional detective Albert Campion has a flat at 17A Bottle Street, Piccadilly, over a police station, although Bottle Street is equally fictitious. Several P.G. Wodehouse novels use the setting of Piccadilly as the playground of the rich, idle bachelor in the inter-war period of the 20th century. Notable instances are present in the characters of Bertie Wooster and his Drones Club companions in the Jeeves stories, and the character of James Crocker in the story "Piccadilly Jim". Dorothy Sayers' fictional detective Lord Peter Wimsey is described as living at 110A Piccadilly in the inter-war period. The street is a square on the British Monopoly board, forming a set with Leicester Square and Coventry Street. When a European Union version of the game was produced in 1992, Piccadilly was one of three London streets selected, along with Oxford Street and Park Lane. In 1996, Latvian singer Laima Vaikule released an album titled Ya vyshla na Pikadilli ("I Went Out on Piccadilly"). ^ Piccadills were stiff collars with scalloped edges and a broad lace or perforated border then in fashion. ^ His second wife was Mary, daughter of Samuel Higgins, an apothecary. ^ Piccadilly has also been described as a variation of the old Dutch word "Pickedillikens", meaning the extreme or utmost part of something. ^ Edward Hobart, Robert's son-in-law, and a man claiming to be a great-nephew, John Baker, of Wellington, Somerset, or Payhembury, Devon. ^ The street was officially known as Portugal Street until circa 1750. ^ a b Taggart, Caroline (13 June 2012). "The surprising reasons behind London's oldest place names". The Daily Telegraph. Retrieved 23 March 2015. ^ a b c d e F. H. W. Sheppard, ed. (1960). "Piccadilly, South Side". Survey of London. London: London County Council. 29–30: 251–270. Retrieved 26 March 2015. ^ Kingsford 1925, p. 97. ^ a b c d e f g F. H. W. Sheppard, ed. (1963). "The Early History of Piccadilly". Survey of London. London: London County Council. 31–32: 32–40. Retrieved 26 March 2015. ^ Kingsford 1925, p. 73. ^ Le Vay 2012, p. 112. ^ Dasent 1920, p. 8. ^ a b c d Kingsford 1925, p. 98. ^ Street 1907, pp. 3–4. ^ Wheatley 1870, p. 2. ^ Wheatley 1870, p. 83. ^ a b Kingsford 1925, p. 104. ^ Walford, Edward (1878). "Mansions in Piccadilly". 4. Old and New London: 273–290. Retrieved 23 March 2015. ^ Moore 2003, p. 116. ^ "Burlington House". Royal Society. Retrieved 1 August 2015. ^ "Building History". St James's Church, Piccadilly. Retrieved 23 March 2015. ^ Kingsford 1925, p. 40. ^ Wheatley 1870, p. xiv. ^ Wheatley 1870, p. 15. ^ a b c Weinreb et al 2008, p. 639. ^ McDonald 2004, p. 98. ^ Fullmann 2012, p. 61. ^ a b Binney 2006, p. 20. ^ a b Timbs 1866, p. 221. ^ "Lost". The Times. London, England. 19 December 1789. p. 1. Retrieved 26 June 2015 – via Newspapers.com. ^ "Cheshire House 66A Eaton Square, and 52 Eaton Mews West, SW1". Country Life. 196: 105. 2002. Retrieved 26 June 2015. ^ Macqueen-Pope 1972, p. 119. ^ Weinreb et al 2008, p. 640. ^ "Limkokwing University Campuses & Contact Centres". Limkokwing University of Creative Technology. Archived from the original on 31 December 2007. Retrieved 10 January 2008. ^ Bedoire & Tanner 2004, pp. 129–30. ^ Morton 2014, p. 155. ^ a b Weinreb et al 2008, p. 10. ^ Weinreb et al 2008, p. 766. ^ Jones 1833, p. 157. ^ Macqueen-Pope 1972, p. 77. ^ Nineteenth-century Studies 2004, p. 145. ^ Starkey & Starkey 2001, p. 48. ^ London Night and Day, 1951: A Guide to Where the Other Books Don’t Take You. Old House Books. 2014. Retrieved 18 August 2018. ^ Historic England. "Former Royal Institute of Painters in Water Colours premises, now forming part of Prince's House (1265805)". National Heritage List for England. Retrieved 18 August 2018. ^ "Welcome to BAFTA 195 Piccadilly". BAFTA. Retrieved 18 August 2018. ^ Gillian, Leslie (13 December 1998). "Design: Goodbye, Piccadilly..." The Independent. Retrieved 23 March 2015. ^ Duffy, Jonathan (25 January 2006). "When heroin was legal". BBC News. Retrieved 23 March 2015. ^ Burr 1983, p. 883. ^ Burr 1983, p. 885. ^ "Police storm squat in Piccadilly". BBC News. Retrieved 23 March 2015. ^ Berridge 1990, p. 162. ^ Raistrick & Davidson 1985, p. 110. ^ "Piccadilly Circus". Encyclopædia Britannica. 5 January 2013. Retrieved 23 March 2015. ^ a b c "Central London Bus Map" (PDF). Transport for London. Archived from the original (PDF) on 5 July 2015. Retrieved 30 July 2015. ^ "Metropolitan Improvements – Hyde Park Corner". Hansard. 31 May 1883. Retrieved 30 July 2015. ^ "The Widening of Piccadilly". Hansard. 15 August 1901. Retrieved 30 July 2015. ^ "Traffic signals (Piccadilly)". Hansard. 8 February 1932. Retrieved 30 July 2015. ^ "Building the Hyde Park Corner Underpass". Museum of London. Retrieved 23 March 2015. ^ "Hyde Park South Carriage Drive". Hansard. 13 November 1962. Retrieved 23 March 2015. ^ York 2013, p. 19. ^ Connor 2006, pp. 28–32. ^ Ciment & Russell 2007, p. 1083. ^ "The Arcadians, operetta~Act 3. All down Piccadilly". AllMusic. Retrieved 23 January 2017. ^ Cook 2013, p. 56. ^ a b Karschay 2015, p. 109. ^ Halliday 2013, p. 71. ^ Panek 1979, p. 131. ^ McIlvaine, Sherby & Heineman 1990, pp. 30–31. ^ Dorothy Sayers. "Whose Body". Retrieved 24 October 2017. ^ Moore 2003, p. 86. ^ Moore 2003, p. 113. ^ "Я вышла на Пикадилли" (in Russian). Laima.com. Retrieved 25 March 2016. Bedoire, Fredric; Tanner, Robert (2004). The Jewish Contribution to Modern Architecture, 1830–1930. KTAV Publishing House, Inc. ISBN 978-0-88125-808-0. Berridge, Virginia (February 1990). Drugs research and policy in Britain: a review of the 1980s. Avebury. ISBN 978-0-566-07045-7. Binney, Marcus (2006). The Ritz Hotel, London. Thames & Hudson. ISBN 978-0-500-51279-1. Ciment, James; Russell, Thaddeus (2007). The Home Front Encyclopedia: United States, Britain, and Canada in World Wars I and II. 1. ABC-CLIO. ISBN 978-1-576-07849-5. Connor, J. E. (2006) . London's Disused Underground Stations (2nd (revised) ed.). Capital Transport. ISBN 978-1-85414-250-4. Cook, Matthew (2013). Powell, Kerry; raby, Peter (eds.). Oscar Wilde in Context. Cambridge University Press. ISBN 978-1-107-72910-0. Dasent, Arthur Irwin (1920). Piccadilly in Three Centuries: With Some Account of Berkeley Square and the Haymarket. Macmillan and Company, limited. Fullmann, Joe (2012). Frommer's London Day By Day. John Wiley & Sons. ISBN 978-1-119-99486-2. Halliday, Stephen (2013). From 221B Baker Street to the Old Curiosity Shop: A Guide to London's Famous Literary Landmarks. The History Press. ISBN 978-0-752-49252-0. Jones (1833). Metropolitan Improvements, Or London in the 19th Century. Jones & Company. Karschay, Stephan (2015). Degeneration, Normativity and the Gothic at the Fin de Siècle : Palgrave Studies in Nineteenth-Century Writing and Culture. Palgrave Macmillan. ISBN 978-1-137-45033-3. Le Vay, Benedit (2012). Ben Le Vay's Eccentric London: A Practical Guide to a Curious City. Bradt Travel Guides. ISBN 978-1-841-62394-8. Macqueen-Pope, Walter James (24 February 1972). Goodbye Piccadilly. David and Charles. McDonald, Guy (2 February 2004). England. New Holland Publishers. ISBN 978-1-86011-116-7. McIlvaine, E; Sherby, L.S; Heineman, J.H. (1990). P.G. Wodehouse: A comprehensive bibliography and checklist. New York: James H. Heineman. pp. 30–31. ISBN 087008125X. Morton, Frederic (21 October 2014). The Rothschilds: A Family Portrait. Diversion Books. ISBN 978-1-62681-394-6. Nineteenth-century Studies. Southeastern Nineteenth-Century Studies Association. 2004. Panek, LeRoy (1979). Watteau's Shepherds: The Detective Novel in Britain, 1914–1940. Popular Press. ISBN 978-0-879-72132-9. Raistrick, Duncan; Davidson, Robin (1985). Alcoholism and Drug Addiction. Churchill Livingstone. ISBN 978-0-443-03092-5. Starkey, Paul; Starkey, Janet (22 September 2001). Travellers in Egypt. I.B.Tauris. ISBN 978-1-86064-674-4. Street, George Slythe (1907). The Ghosts of Piccadilly. G. P. Putnam's Sons. Timbs, John (1866). Club Life of London with Anecdotes of the Clubs, Coffee-Houses and Taverns of the Metropolis During the 17th, 18th, and 19th Centuries: By John Timbs. Richard Bentley. Wheatley, Henry Benjamin (1870). Round about Piccadilly and Pall Mall: Or, A Ramble from the Haymarket to Hyde Park. Smith, Elder & Company. York, Peter (7 March 2013). The Blue Riband: The Piccadilly Line. Penguin Books Limited. ISBN 978-1-84614-680-0. Wikimedia Commons has media related to Piccadilly. Look up Piccadilly in Wiktionary, the free dictionary.